My husband has taken to the (very old man) habit of writing down the daily snowfall amounts on our kitchen calendar. In November and December it was definitely an interesting pursuit, but since he last wrote “2 inches” on January first, we had not had ANY appreciable snow (and maybe one dusting that didn’t stick around for more than an hour?). Considering we live in the mountains of Colorado, that is BIZARRE and kind of scary for both winter skiing and summer drought reasons! At any rate, we have spent a fair amount of time the past seven weeks enjoying sunny weather in the 50s and feeling like it was very much spring time. Well, winter is back with a vengeance. 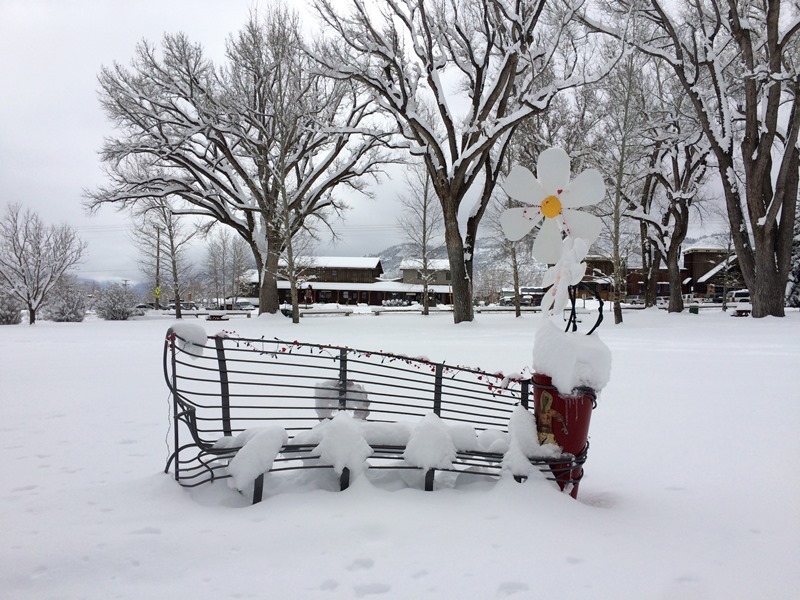 Jaime’s Memorial Bench – Winter Style! Sunday afternoon it started snowing… and it just didn’t stop! By Monday morning we woke up to about 14″ of snow here in town, and by Tuesday morning the total snowfall accumulations were about 20″ at our house. 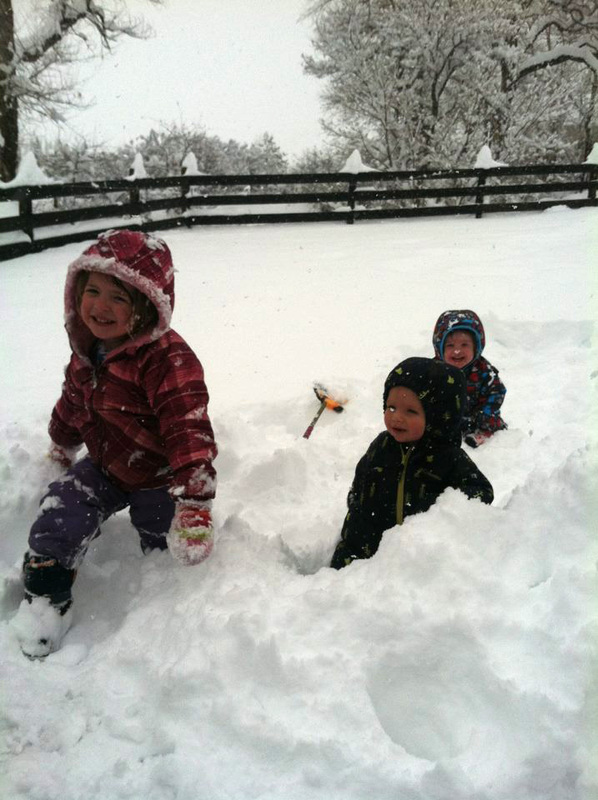 Area ski resorts got upwards of 30-40″ of snow (at slightly higher elevations than us). Now that’s a good snowstorm! I can’t say I’m loving how long it takes to get the kids dressed to do anything at this point, but they are sure enjoying it! 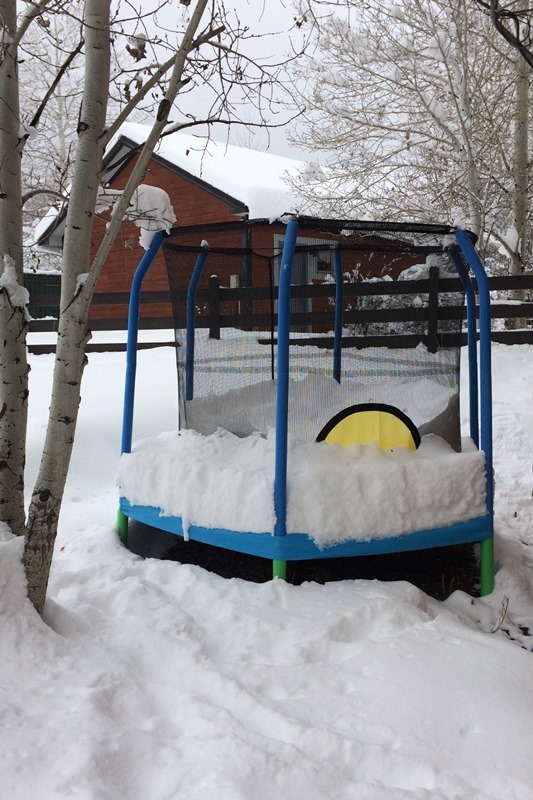 We’ve only had one decent snow and we’ve all been too sick to enjoy it properly 😦 how do your kids like their trampoline? G loves his! I need that trampoline. Where’d she get it? Wal-Mart I think? Ha! It’s the 7′ Bazoongi I believe. We had 15 inches and it shut down everything last week. Seriously, I did not work all week between the snow and ridiculously freezing temperatures. Glad to see the kids enjoying it! Yeah, around here we are pretty well equipped to deal with the snow. 🙂 Also, it was still decent temps here – mid 30s for the most part, so not too bad to be out and about in. By yesterday it was sunny skies for the local ski resorts so 35 felt like 65. Pretty epic ski conditions! I think we got all your snow this year!